Whether you are a keen cyclist or simply enjoy the occasional bike ride at the weekend and just want to give it a go, here is our suggested itinerary to do just that. You cycle mainly on coastal roads and rural tracks, using mountain bikes that are ideal for the terrain. A good level of fitness is required as some routes are partly uphill, although not steep gradients. Note: Electronic bikes (E-bikes) can be arranged for a supplement of £175 per person. Arrive at Ponta Delgada airport and transfer to the Solar do Conde in Capelas. The Solar do Conde is located in the village of Capelas on the north coast of the island, approximately 12km from Ponta Delgada and within walking distance of the ocean (600m). The estate, built around an elegant manor house, consists of 27 spacious cottages. Surrounded by extensive gardens, the property is best suited to those wishing to relax in a quiet, tranquil setting or wanting to explore the island by car, bike or on foot. Overnight at Solar do Conde. In the morning, the bicycles will be delivered to the Solar do Conde. After an introductory briefing with our representative, depart for a 31km ride along the north coast, passing through the villages of São Vicente, Ferreira and Aflitos before returning to Capelas. Today’s journey (53km) will depart Capelas, heading west to the Sete Cidades lakes. This route includes a stop at the ‘Vista do Rei viewpoint from which you can enjoy a spectacular view over the twin lakes, one blue in colour and the other green. Return to Capelas. Day 4 - North coast of São Miguel. Today’s route (49km) will initially follow the beautiful north coast of São Miguel. You will start with a plain stretch of road followed by a 5km hill climb along the coastal road through the villages of Fenais da Luz, Calhetas and Rabo de Peixe to the town of Ribeira Grande. After a visit of the town, including the picturesque town square, continue your ride to Furnas. Your luggage will be transported to your hotel in Furnas. Overnight at the Terra Nostra Garden Hotel. Today’s ride (25km) will depart from your hotel in Furnas. This is a gentle route during which you will visit the hot springs (in which the traditional meal, Cozido das Furnas, is cooked), Furnas Lake and the typical fishing village of Ribeira Quente. Take time in Ribeira Quente to relax, stroll along the beach or enjoy a meal before returning to Furnas. Free time in Furnas: Time to relax and enjoy a stroll through the 30-acre Botanical Gardens owned by the Terra Nostra Garden. 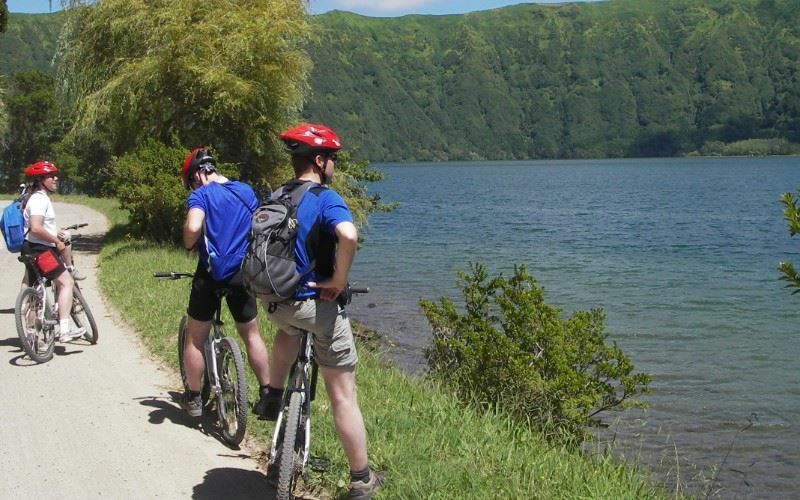 Alternatively, you can cycle from Furnas to the village of Povoação (25km) and back again. This route has many accentuated uphill and downhill stretches but, if you are in shape, this ride will give you ample opportunity to admire the beautiful countryside of the Povoação valley. Day 7 - Furnas to Vila Franca do Campo. Today you will cycle 20km, along the southern coastline, from Furnas to Vila Franca do Campo. The route will commence with an uphill (3km) ride, followed by a more relaxed pace along downhill and flat roads until you reach your overnight accommodation at the Vinha d'Areia Hotel. Your luggage will be transported to your hotel in Vila Franca do Campo. The 3-star Vinha d'Areia Hotel is located on the waterfront of Vila Franca do Campo and has 49 air-conditioned rooms, all with balcony and sea/marina view. Comfortably furnished, rooms are equipped with private facilities (bath and/or shower), telephone and cable TV. There is a panoramic restaurant serving Azorean specialities, bar and outdoor swimming pool. Overnight at the Vinha d'Areia Hotel. Transfer to Ponta Delgada airport for your return flight home.